Do you believe the Old Testament is inspired of God? Many Christians don't. They don't accept the Old Testament as completely accurate and reliable. If they happen to read it at all, they read it like an ordinary book, without really believing its teachings or wanting to abide by them. Jesus Christ and the apostles did accept the Old Testament. They lived by it. How about you? Have you honestly studied and proved the writings of the Old Testament, pages that constitute two thirds of the Bible? Ironically, to many Christians the Old Testament is not an integral part of the Holy Scriptures. They often consider it only a collection of Jewish literature. Just as ironically, most Jews reject the New Testament and only consider the Old holy. As a result of this confusion, the Jews — who don't accept Jesus as the Christ — are still waiting for the Messiah to come, while many Christians — who supposedly believe in Him — no longer wait for Christ's Second Coming! No wonder neither Jews nor Christians, as a whole, really understand the Bible. Examine the New Testament. To which "scriptures" did Christ and His apostles refer? What "scripture" did Christ read in the synagogue every Sabbath? What "scripture" did His disciples use to preach the Gospel after His death and resurrection? What "scripture" did the apostle Peter have in mind when he wrote that "no prophecy of the scripture is of any private interpretation. For the prophecy came not in old time by the will of man: but holy men of God spake as they were moved by the Holy Ghost" (II Pet. 1:20-21)? Christ said that the Scripture cannot be broken (John 10:35). At the time He spoke, none of the New Testament writings were yet available. Only the Old Testament constituted the "scripture"! A man came one day to Christ, knelt before Him and asked what he should do to inherit eternal life. Christ told him, "Thou knowest the commandments, Do not commit adultery, Do not kill, Do not steal, Do not bear false witness, Defraud not, Honour thy father and mother" (Mark 10:19). Christ here quoted some of the Ten Commandments. These commandments were given by God to Moses — in the Old Testament. They are part of the Holy Scriptures. 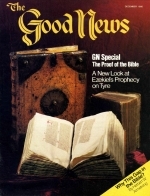 Several years later, the apostle Paul, under God's inspiration, wrote: "All scripture is given by inspiration of God, and is profitable for doctrine, for reproof, for correction, for instruction in righteousness: That the man of God may be perfect, throughly furnished unto all good works" (II Tim. 3:16-17). Again, when Paul wrote, the only "scripture" in existence was the Old Testament. The New Testament was not completed. Paul further told Timothy that the "scriptures" were holy: "But continue thou in the things which thou hast learned and hast been assured of, knowing of whom thou hast learned them;. And that from a child thou hast known the holy scriptures, which are able to make thee wise unto salvation through faith which is in Christ Jesus" (verses 14-15). Think! What "holy scriptures" had Timothy learned as a child? He could only have had knowledge of the Old Testament writings. The apostles had no doubt that the Old Testament was God's inspired Word. The New Testament refers to the Old Testament about 250 times. You cannot accept the New Testament without recognizing the authority of the Old. The two don't contradict; they complete each other. The Bible is one book. It cannot be divided. How many pay attention to the numerous references the Old Testament makes to Christ, His birth, His mission, His sufferings and His death? When John the Baptist heard of the works of Christ, he sent Him two of his own disciples to inquire, "Art thou he that should come, or do we look for another?" (Matt. 11:3). How did John the Baptist know that a Messiah was to come? Where had he read about Him? In the writings of the Old Testament. The Pharisees and scribes at the time of Christ boasted of their knowledge of Scripture. However, they did not understand it. Blinded as they were, they only expected the Messiah to come in all His glory; they had not seen — in Scripture — that He first would come as a human being to die for the sins of mankind. Notice what Christ told His disciples after His death and resurrection: "These are the words which I spake unto you, while I was yet with you, that all things must be fulfilled, which were written in the law of Moses. and in the prophets. and in the psalms. concerning me. Then opened he their understanding, that they might understand the scriptures. And said unto them, Thus it is written, and thus it behoved Christ to suffer, and to rise from the dead the third day" (Luke 24:44-46). 1) The law (Torah): Genesis, Exodus, Leviticus, Numbers and Deuteronomy. 2) The prophets (Nebim): Joshua, Judges, Samuel, Kings, Isaiah, Jeremiah, Ezekiel and the minor prophets (Hosea, Joel, Amos, Obadiah, Jonah, Micah, Nahum, Habakkuk, Zephaniah, Haggai, Zechariah and Malachi). 3) The psalms or writings (Kethubim): Psalms, Proverbs, Job, Song of Solomon, Ruth, Lamentations, Ecclesiastes, Esther, Daniel, Ezra, Nehemiah and Chronicles. Micah foretold the birthplace of the Messiah: "But thou, Bethlehem Ephratah, though thou be little among the thousands of Judah, yet out of thee shall he come forth unto me that is to be ruler in Israel; whose goings forth have been from of old, from everlasting" (Mic. 5:2, see also Matt. 2:6). The "scripture" revealed that "Christ cometh of the seed of David, and out of the town of Bethlehem" (John 7:42). David spoke of the "stone which the builders refused" that became the "head stone of the corner" (Ps. 118:22). Who was this "stone"? Jesus said, "Did ye never read in the scriptures, The stone which the builders rejected, the same is become the head of the corner: this is the Lord's doing, and it is marvellous in our eyes?" (Matt. 21:42). Daniel, in his "70 weeks" prophecy, indicated the times of both the birth and crucifixion of Christ (Dan. 9). He spoke of the Messiah who would "be cut off" (verse 26). Jesus was indeed cut off after 3V2 years of His ministry. The prophet Isaiah described the sufferings and crucifixion of Christ: "He is despised and rejected of men; a man of sorrows, and acquainted with grief: and we hid as it were our faces from him; he was despised, and we esteemed him not. Surely he hath borne our griefs, and carried our sorrows: yet we did esteem him stricken, smitten of God, and afflicted But he was wounded for our transgressions, he was bruised for our iniquities: the chastisement of our peace was upon him; and with his stripes we are healed" (Isa. 53:3-5, see also I Pet. 2:24). Isaiah further revealed: "As many were astonied at thee; his visage was so marred more than any man, and his form more than the sons of men: So shall he sprinkle many nations; the kings shall shut their mouths at him: for that which had not been told them shall they see; and that which they had not heard shall they consider" (Isa.52:14-15). The prophets even foretold that Christ, when thirsty on the cross, would be given vinegar to drink (Ps. 69:21,.John 19:29), and that Judas would betray His Master for 30 pieces of silver (Zech. 11:12, Matt. 26:14-15). Strange as it may seem, Christianity today rejects the only sign Christ gave to prove His Messiahship. When the scribes and Pharisees asked of Him a sign, He answered, "An evil and adulterous generation seeketh after a sign; and there shall no sign be given to it, but the sign of the prophet Jonas: For as Jonas was three days and three nights in the whale's belly; so shall the Son of man be three days and three nights in the heart of the earth" (Matt. 12:39-40). Jonah is one of the minor prophets mentioned in the Old Testament. Sent by God on a mission to Nineveh, he first attempted to flee to Tarshish. Overtaken by a storm, and cast into the sea by the ship's captain and crew, he was swallowed by a great fish. "And Jonah was in the belly of the fish three days and three nights" (Jonah 1:17). Hardly anyone questions the length of time Jonah spent in the belly of the fish. Why, then, do most Christians reject the very sign Jesus gave to show that He Himself would be buried three days and three nights? Try to count three days and three nights between Friday afternoon (supposedly the time of Christ's death) and Sunday morning at dawn (the presumed time of His resurrection). It can't be done! Don't Christians know how to count? The Old Testament and Christ's statement are. accurate; Christ was dead for three days and three nights. But you must understand how this time period is counted. Read our free booklet, The Resurrection Was Not On Sunday. The apostle Peter, upon receiving the Holy Spirit on the day of Pentecost, gave a powerful sermon and showed the people their sins — theirs as well as their forefathers. He also spoke of prophecies concerning the Messiah. "And now, brethren, I wot that through ignorance ye did it, as did also your rulers. But those things, which God before had shewed by the mouth of all his prophets that Christ should suffer, he hath so fulfilled. Repent ye 'therefore, and be converted, that your sins may be blotted out, when the times of refreshing shall come from the presence of the Lord... For Moses truly said unto the fathers, A prophet shall the Lord your God raise up unto you of your brethren, like unto me; him shall ye hear in all things whatsoever he shall say unto you. And it shall come to pass, that every soul, which will not hear that prophet, shall be destroyed from among the people Yea, and all the prophets from Samuel and those that follow after, as many as have spoken, have likewise foretold of these days" (Acts 3:17-19, 22-24). Once again the writings of the Old Testament — the Scripture that cannot be broken — confirm the coming of the Messiah. The apostle Paul, who was taught at the feet of the famous Jewish scholar Gamaliel, bitterly persecuted Christians before his conversion. However, Christ opened his understanding, and thus began a new life for Paul. He surrendered totally to Christ and consecrated his whole life to proclaiming the Gospel: "But Saul increased the more in strength, and confounded the Jews which dwelt at Damascus, proving that this is very Christ" (Acts 9:22). But what were the Scriptures he used in order to convince the people — Jews as well as gentiles? The books of the Old Testament, of course. Later in his life, Paul, at Rome, "expounded and testified the kingdom of God, persuading them concerning Jesus, both out of the law of Moses, and out of the prophets, from morning till evening" (Acts 28:23). Did you catch that? Paul preached the Gospel from the books of the law of Moses (the Pentateuch) and the writings of the prophets, and explained to the gentiles just what the Kingdom of God is. Throughout his ministry, he used the same "holy scriptures" — the books of the Old Testament — to prove that Jesus Christ is the foretold Messiah. In Thessalonica, three Sabbaths consecutively, he "reasoned with them out of the scriptures, Opening and alleging, that Christ must needs have suffered, and risen again from the dead; and that this Jesus, whom I preach unto you, is Christ" (Acts 17:3). Remember that at the time of these teachings, the New Testament did not yet exist. Not only Paul but also all the other apostles and disciples used the books of the Old Testament to prove that Jesus is the Christ: "And a certain Jew named Apollos, born at Alexandria, an eloquent man, and mighty in the scriptures, came to Ephesus.... And he began to speak boldly in the synagogue: whom when Aquila and Priscilla had heard, they took him unto them, and expounded unto him the way of God more perfectly. And when he was disposed to pass into Achaia, the brethren wrote, exhorting the disciples to receive him: who, when he was come, helped them much which had believed through grace: For he mightily convinced the Jews, and that publicly, shewing by the scriptures that Jesus was Christ" (Acts 18:24, 26-28). One has to be blind not to see these truths revealed in the Bible! However, humanity as a whole is blind, because men have cut themselves off from God. They have turned away from His teachings. They continue to reject the authenticity and the authority of the Bible — both the Old and New Testaments. For more than 45 years, this Work has been proclaiming that Jesus Christ — the Messiah, the Anointed One prophesied in the Old Testament — will soon return to establish God's Kingdom on earth. At His first coming, He had another mission. He came to die for our sins and to proclaim the good news of God's coming government on earth. This is what the "scriptures" reveal — both the Old Testament and the New. Are you beginning to see that the Old Testament is as much a part of the inspired Word of God as is the New Testament? To merely believe the Bible is of little value, unless you live by its teachings. A true Christian lives by "every word that proceedeth out of the mouth of God" (Matt. 4:4). And every word means every word — that is, the whole Bible, including all of the books of the Old Testament. Be honest with yourself and examine your beliefs! Are they in harmony with the Bible's teachings? Are you persuaded that Jesus Christ — your Lord and Savior — is truly the promised Messiah of whom the prophets of old, as well as the law and the writings, have spoken, and who will soon return to establish His Kingdom on earth? If you are not, it's high time to wake up! His coming may catch you by surprise — and unprepared!